I answered the TEXN/THC2 Molden Heath Batphone. "Hullo?" "Where? What do you need? Okay, on it." I hung up, switched into my cane, undocked, and started typing half completed sentences into our alliance chat. Moros Tackled. RANSM comms. DPS. Need peeps. "Where?" I posted the link and logged onto coms. 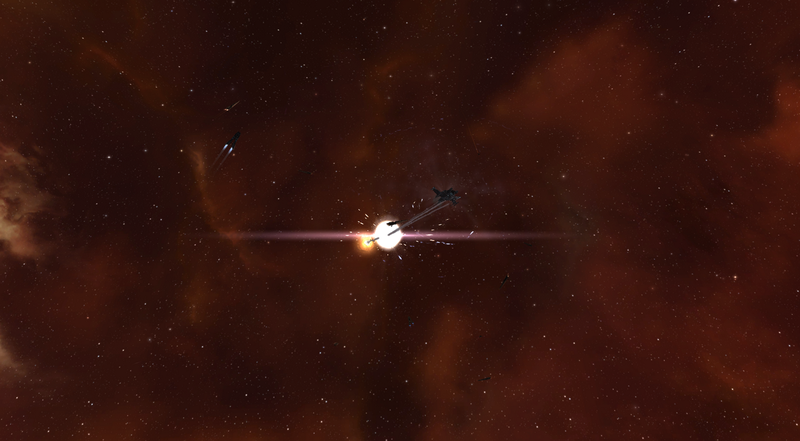 Requests for fleet invites started to fly as battlecruisers sped through the systems. "I think we just broke his tank." "Yeah, he says his tank is broken." Collective, "Shits" were heard. "How long?" I was only 3 jumps away at that point. Go hurricane, go! Is this killmail whoring? Yes. Am I ashamed? No. :D In fact, I am delighted to be old enough and considered able enough to answer the batphone. However, in the defense of killmail whoring (which needs no defense :P), whenever a capital is tackled like that you are expecting backup to come at any moment. Until the ship was down and everyone was safe, people were going to be needed. I landed one jump out as he went into structure. "I'm not going to make it," I moaned. 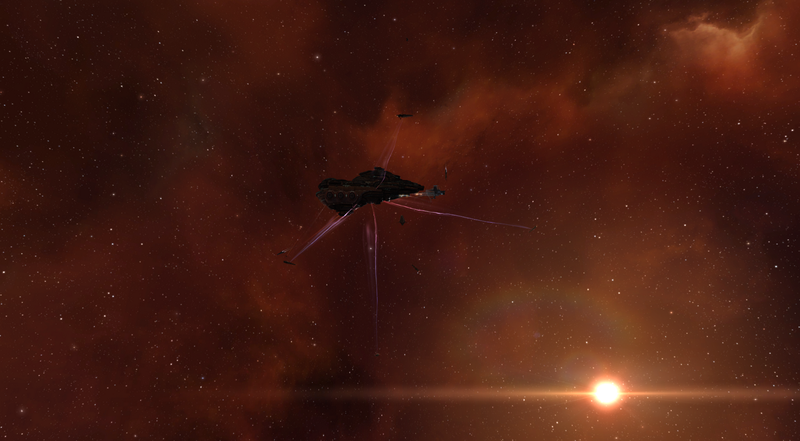 I then landed in system when he was in half structure and bounced in. "You said he was in structure." This is where my lack of expierence comes into play. In normal fights structure = pop. This is a drednought. 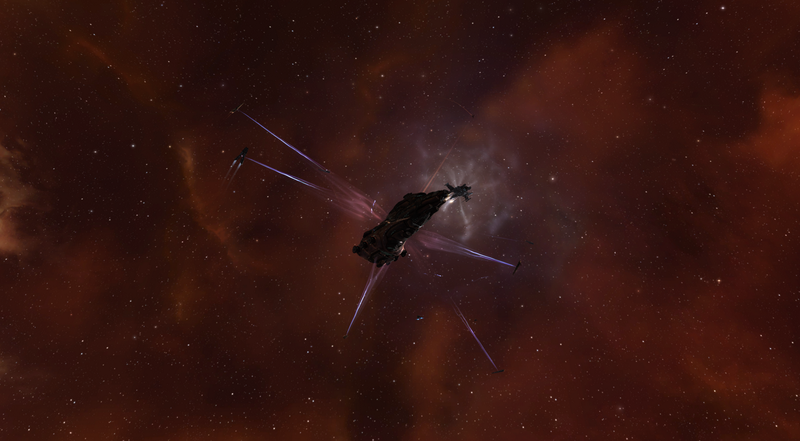 It takes a few more minutes for a battlecruiser/cruiser/frig pack to make him go pop in structure. I landed on the field. Pirates! Pirates! ERRYWHERE PIRATES! It was a pirate kitchen sink corp fleet. This is the pretty clear picture. And this is what was actually happening. 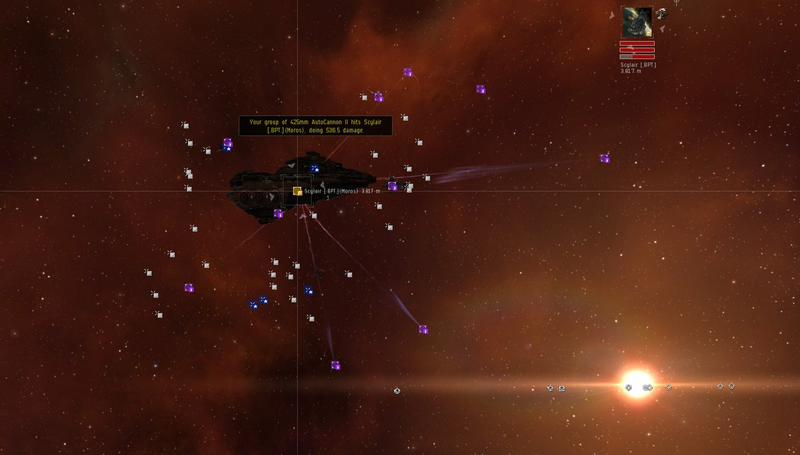 For anyone that does not play eve, the non purple squares are drones. Drones are very tiny and you have to be super close to see them in your regular playing field. Why didn't he self destruct? They were chewing at him for over 10 minutes. The reason is because he is a decent creature. In local they chatted as he sat through seige and they tried to kill him. He'd had his ship for two years and he was happy to go down fighting. He was found shooting a POS. The call went out and rippled across MH with good response as they tackled him and waited for backup. And he died. And we gave the gf (good fight) in local. I flew my flashy red GCCd self back home. Not the brightest idea but I was buzzed a bit. The "exploded" player was actually a very decent target, that is a pleasant surprise. He was not angry for losing is ship. A gentleman. But was he alone shooting the POS, thats a mistake if you ask me to be alone on that shiny ship. Did anyone came to is rescue ? Congrats on the Capital kill, and congrats on being able to use the bat-phone. No one came to the rescue. We bailed quickly.